I really should have known when I read this that I’d be in for a disappointment. I’m quite prepared to put my hands up and admit we made a few mistakes along the day – such as ignoring the guidebook’s exhortations to buy tickets in advance in Krakow, and taking a Polish-language tour rather than waiting for the next English one – but even if we hadn’t I still think our impressions wouldn’t have been all that different. The Wieliczka Salt Mine was first founded in the 13th century and continued as a working mine until 1996, and it’s huuuuge. It’s even apparently impressive enough that it made it onto the very first listing of World Heritage sites (the committee decided it was more of a priority listing than Auschwitz, which had to wait another year). 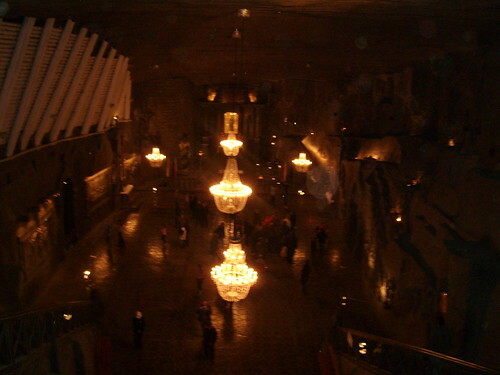 The workings of the mines, and the sheer scale of it I have to admit is impressive, but the bit that it’s most famous for are the various underground chapels carved out of the salt, the biggest of which is the the enormous chapel of St. Kinga. It’s undeniably breathtaking: over 100m underground, 54m long and 12m high, and every single bit – altar, statues (including one of the old pope, obviously), chandeliers – are carved out of salt. Unfortunately to see the chapel you have to endure a ridiculously overlong tour (about three hours) – after not very long, one salt chamber starts to look very much like another – including a particularly rubbish (and confusing) son et lumiere. So by the time you get to the chapel (about 2 hours in), you’ve started to lose the will to live; afterwards, the knowledge that you’ve seen the best bit and still have an hour to go, with no chance of escape, is pretty crushing. As if to annoy you even further, the tunnels force you to go through about six gift shops (I’m not exaggerating here) and two cafes before you even get to the lift; once there you face a further queue that took us another half hour. I must admit the lift is quite an experience – a tiny, 4-deck lift that has you sandwiched in like sardines – although probably not one I fancy repeating. Should have gone with my original plan of exploring the model socialist city of Nowa Huta instead. Will have to do that next time instead (and there will definitely be a next time, there’s still lots more to explore both in the city, and in places like Auschwitz and the Tatras mountains nearby). 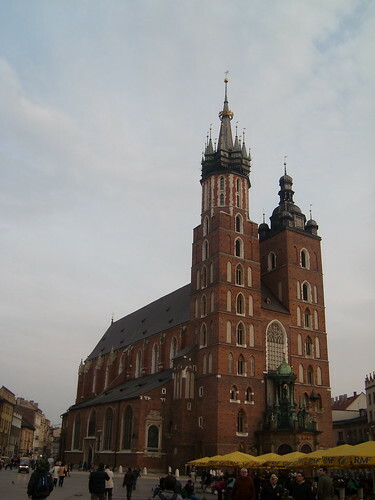 While Krakow may not have been obviously physically damaged very much by World War 2, it was famously damaged in an equally serious way through the extermination of its Jewish population. 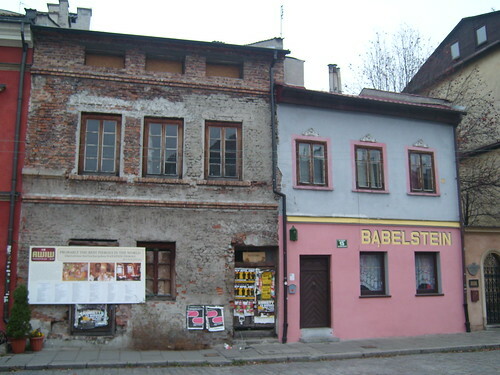 Before the war, there were around 70,000 Jews living in the city, largely in the suburb of Kazimierz, just outside the old town. The signs of the former population are obvious – several synagogues, two cemetaries (sadly closed when we there), and now lots of Jewish theme restaurants. I’m not quite sure how I feel about the latter – keeping the memory alive or tacky tourist traps? Sadly we didn’t have the time to stop off at the Galicia Jewish Museum to see more of the history, something I’ll definitely remedy when I return. After the German annexation of Poland, the Jews were moved into a ghetto in Podgorze, just over the the River Vistulafrom Kazimierz. 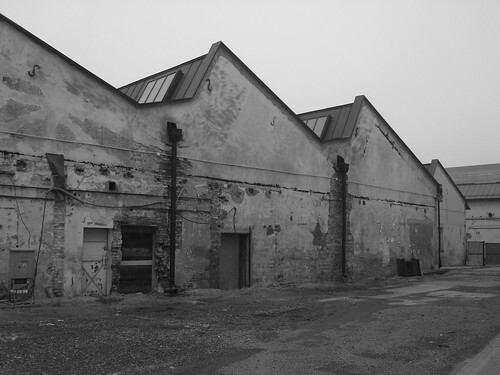 15,000 were crammed into houses that had formerly housed 3,000 people, and they were walled in before eventually being moved to Auschwitz, a few hours away. The square where the trains left from is now called Ghetto Heroes’ Square. 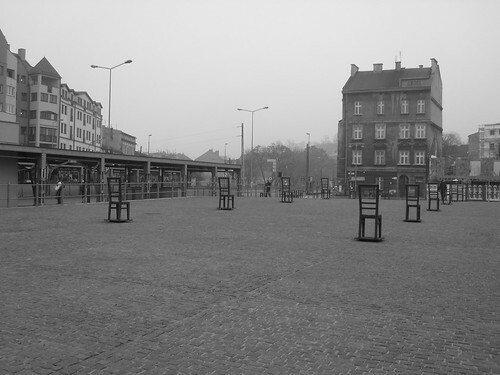 The square is now filled with a memorial, made up of oversized bronze chairs, symobilising the posessions that were abandoned in the square as the Jews were deported. Other than the memorial there is very little sign that the ghetto ever existed – one small fragment of wall (which we didn’t find) is all that’s left. On the other side of the railway line from the square is Oscar Schindler’s former factory, where he famously saved the lives of over 1,000 Jews. Apparently it’s due to be redeveloped as a museum; it’s in quite an out of the way location and nothing much seemed to be happening while we were though, so it remains to be seen what will happen to it. These days Podgorze is very quiet and a bit off the tourist trail; Kazimierz on the other hand is thriving both with its Jewish theme restaurants but also with most of the coolest bars in Krakow, one of which is a reminder of yet another key part of the city’s past – it’s called Propaganda, and is a communist theme bar. Lenin would be spinning in his grave. After my third disappointing experience of Portuguese cuisine last month, I had slightly higher hopes for Polish food. Overall it wasn’t too bad – certainly not as bad as Portugal, but with none of the complexities of flavour that characterise my favourite cuisines either. I’ll probably be offending millions of Poles (and Russians and Ukrainians too), but our experience of the national soup (Borscht) wasn’t exactly great. Sour (through fermentation) is not really my cup of tea at the best of times, but when the fat in the soup starts congealing in front of you in the cold November air, it’s really offputting. My main expectation before going was that the food would be pretty hearty and stodgy. Our experience with dumplings and Pierogy (stuffed ravioli-like dumplings) confirmed that. Nice enough, but I think we were unlucky with them, I think in the right place and the right sauce they’d be a lot nicer. The best thing about large-scale Polish immigration to London has been the availability of a wide range of Polish sausages in local shops. Food-wise there’s not much more I love than a bit of spicey cured pork, so getting to try the local varieties was always going to be a hit. Fresh Kabanosy were even nicer than back home. Just a shame we didn’t see more of them in the restaurants, and that I didn’t get time to try more. Even better was discovering the Polish version of the one thing I love more than cured meat: Pizza. Called Zapiekanki, they’re basically a half baguette topped with cheese and other toppings. The perfect way to warm up and fill up after a cold day pounding the streets…or rather if it would have been if the one I ordered hadn’t had the devil’s food itself – mushrooms – sneakily hiding underneath the cheese and Polish salami. I could have cried. 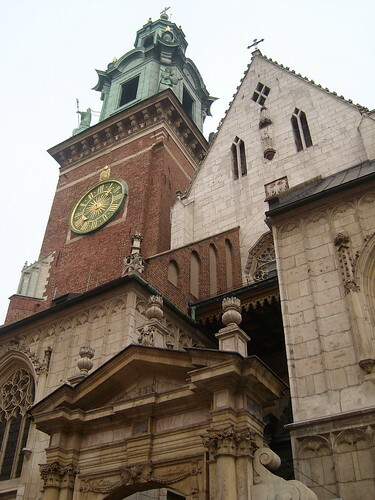 People have often described Krakow to me as being like Prague but not as overrun with tourists. Seeing as I’ve never been to Prague that wasn’t a lot of help in terms of imagining what it’d be like. It’s also a city I’m not very familiar with from telly or from mates’ experience either, so I wasn’t really sure what to expect, which actually made the prospect of visiting more exciting. Somehow central Krakow managed to largely avoid being physically scarred either by the Second World War or the excesses of communist town planning, making it both a historic and very handsome city to wander round. In fact, just wandering around was for me the best way to enjoy the city – actually going inside many of the sights was a little disappointing (notably the cathedral bell tower – lots of queueing, rubbish view). Pretty much every street is worth exploring, with numerous baroque churches and crumbling town houses all over the place. Visiting in November means the whole city is shrouded in fog, making it even more atmospheric. Aside from the general prettiness of the place, the most obvious highlight of the city is the huge market square (apparently the largest of its kind in Europe), dominated by the huge Basilica Mariacka. All around the square are hundreds of bars and restaurants, many of which are in the medieval cellars of the buildings, which can make for a great setting for dinner – I say can, because of course it’s incredibly hit and miss, especially as you can’t really check them out from the outside, what with not being able to see in. Saturday night we hit lucky with an incredible Italian meal (with a genuine Polish celebrity at the next table. According to the waiter, anyway). Sunday was less so, with us having to abandon a meal to make it to the airport when forty-five minutes after ordering it turned out they hadn’t even put the food on. Not the best way to end a great birthday weekend, although certainly not enough to ruin it either: Krakow is definitely one of the best cities I’ve been to in Europe, and one I definitely plan to return to.